A Human Rights Watch report, criticising Israel’s inhumane treatment of African asylum seekers, provides an opportunity to reflect on the extension of the Prevention of Infiltration Law, first used against Palestinians in 1954. In recent weeks, Israeli nationalists, including ministers from the far-right Jewish Home party, have marched through the streets of Tel Aviv, with younger protesters venting their fury at African-owned businesses. They were marching in protest against the High Court decision in late September that the notorious ‘open residential facility’, Holot, should be closed. This facility, where undocumented African migrants can be held without trial for up to a year, is situated in a remote part of the Negev desert and is officially classified as an ‘open-air’ facility. But while detainees are ‘free’ to leave their desert detention accommodation during the day, it is also stipulated that they must be present at the various roll calls which occur at different times throughout the day. The Israeli High Court ruled that both Holot, and amendments made to the Prevention of Infiltration Law in 2012 and 2013, were unconstitutional as they violated the rights to human dignity and liberty which the High Court alleges are fundamental to Israel’s Basic Laws. Protest against the High Court decision does not come solely from wayward far-right members of the public, but from across the political elite. The Interior Minister, Gideon Sa’ar, announced that the authorities would simply not abide by the High Court’s decision, stating that, ‘Giving up on Holot would be a stage of capitulation; the inevitable result would be the assimilation of the infiltrators into Israel society’. 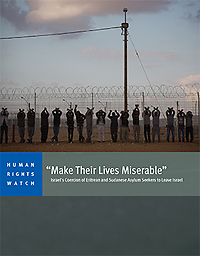 It is this total absence of human dignity within the Israeli asylum system that a new Human Rights Watch report, ‘Make Their Lives Miserable’: Israel’s Coercion of Eritrean and Sudanese Asylum Seekers to Leave Israel, so comprehensively reveals. The primary research for this 83-page report was carried out over a two-week period in January 2014 and involved interviews with twenty-three Eritrean and nineteen Sudanese asylum seekers. It starts with an analysis of the various justifications Israel puts forward for its arbitrary detention of Sudanese and Eritrean asylum seekers, particularly highlighting the amendments to the 1954 Prevention of Infiltration Law and subsequent deportation of so-called ‘infiltrators’, i.e. those who pose an ‘existential threat to the Jewish State’, including those who attempt to enter Israel irregularly. Human Rights Watch is primarily focused on the myriad of ways in which the Israeli immigration authorities thwart any requests by African detainees for asylum in order to coerce them into ‘voluntarily’ returning to Eritrea or Sudan. This consists, in the first instance, of the use of prolonged detention in either the Saharonim or Holot detention facilities, both located in the Negev, even the very mention of which acts as a threat and deterrent to the asylum seekers who are well aware of the centres’ notoriety. The complicated legal and asylum systems, resulting in difficulties securing employment and housing, act as further deterrents, as do the various difficulties in renewing the ‘conditional release’ permits initially given to asylum seekers. All of these deterrents, enforced by the state, intend to, as the former Interior Minister Eli Yishai put it, ‘make their lives miserable’, so that the asylum seekers choose to return to Eritrea or Sudan out of sheer desperation. Human Rights Watch reports that between 2013 and 2014, 6,750 Eritrean and Sudanese migrants left Israel, with the Israeli NGO Hotline for Refugees and Migrants stating that many of those who left described their fear of returning to Holot as the primary reason for returning to Africa. The UNHCR and Hotline provided documentary evidence to prove that in the first half of 2013 over 1,500 migrants were pressured into signing a document saying that they wished to leave Israel. In this way, Human Rights Watch argues, the coercion of migrants to ‘voluntarily return’ acts as a substitute to policies of forced deportation, and makes Israel guilty of violating the ‘non refoulement’ principle (no return to danger) guaranteed under international law. It states that ‘their decision to leave Israel and go home is not a matter of choice if the only alternative is indefinite detention’. In this, the Israeli authorities, however, are utterly transparent, coolly admitting that their policies are designed to force migrants to choose between a rock and a hard place. 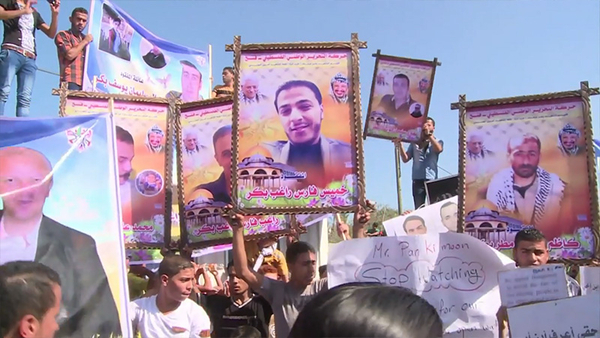 Sa’ar, in response to the High Court’s decision, said that ‘Holot made a decisive contribution to the infiltrators leaving of their own free will’. While there is some truth in Sa’ar’s justification for Israel’s inhumane treatment of asylum seekers – he states that their detention system is similar to that of most western democracies – it should also give cause for a deeper reflection about what is specific to Israel, and what distinguishes it from other so-called similar western democracies. Central to that discussion must be an examination of the continuities between Israeli nation-building, the violent and forced displacement of the Palestinians since 1948, the subsequent creation of a global Palestinian refugee diaspora, and Israel’s treatment of African asylum seekers today. This is largely absent from Human Rights Watch report that looks at the situation purely from a humanitarian perspective. The history of the state of Israel, built on the creation of refugee populations, has always been one that prioritised Israeli security over human rights. Underpinning Israel’s security (as opposed to humanitarian) response to African migrants is a racist and nationalist politics that become all too clear when viewed through the lens of the Prevention of Infiltration Law. In 1954, seven years after the creation of the state of Israel, this law was passed in order to prevent Palestinians, who were dispossessed in 1948, from returning to their homes. The fact that Israel then amended this law for the purpose of preventing the entry of Eritreans and Sudanese asylum seekers only reinforces the racist nature of the law: one that excludes all those considered an ‘existential threat’ to the demographic make- up of the Jewish nation. It should also be recalled that in 2013, it was reported that Ethiopian Jewish migrants in Israel were given birth-control injections often without their consent or knowledge. Yet, the open practice of a eugenics policy that should be an anathema to western-style democracies did not lose Israel its global status as a European-style democracy, due to overwhelming international acceptance of Israel’s need to take whatever measures are necessary to ‘protect’ itself. With the death of around 500 migrants after their boat was rammed off the coast of Malta on September 10, the vast majority of whom came from Gaza, the tragic consequences of Israel’s ultra protectionism has now overflowed into European waters. While much of the media focus centred on the guilt of the traffickers, including those who deliberately rammed the boat, other stories, pointing to different narratives, have emerged from the Palestinian survivors who speak of their despair of living under siege in Gaza and their search for a better life. Abdel Majeed al-Hila, a survivor of the boat tragedy, spoke of his decision to leave Gaza as he had ‘nothing left to make me stay’ after his home was demolished during Israel’s most recent attack (Operation Protective Edge), saying that he ‘dream[t] of sleeping one night without hearing bombing or shelling’. A mother from Gaza, Nawal Asfour, told the Guardian of her son Ahmad’s disappearance on the same journey, saying that he had been injured by an Israeli missile in 2009 and that due to the restrictions on his movement he had not been able to recover. Out of desperation, he had decided to make the dangerous journey to seek vital treatment in Europe. The effects of Israel’s siege on Gaza and its policy to ‘make lives miserable’ for Eritrean and Sudanese asylum seekers speak of similarities and continuities. The misery and desperation for both African asylum seekers and Palestinians force them to attempt dangerous, at times fatal, journeys.